Shravan is one of the holiest months for Hindus – a time for soulful introspection and austerities. Stretching across 30-32 days in July and August, this month is so called because the Shravan star (Nakshatra) rules the sky on this month’s full moon day (Poornima). A couple of festivals are celebrated by many communities across India during this month, but more than the festivities, this whole month itself is considered a good time to surrender to God and exercise self-control in your lifestyle. It is believed that it was during this month that Lord Shiva consumed the haala-haala poison to save the world. When the Gods and demons were churning the milk ocean to get the nectar of immortality, poison started emanating from Vasuki, the snake king who was used as a rope to churn the ocean. Seeing the world reel under the effect of the poison, Lord Shiva immediately consumed the poison, and Goddess Parvati placed her hand on his neck to prevent it from going in. His neck turned blue as the poison stayed there. In order to reduce the effect of the poison, the devas bathed Lord Shiva in Gangajal. The same practice is continued even today. 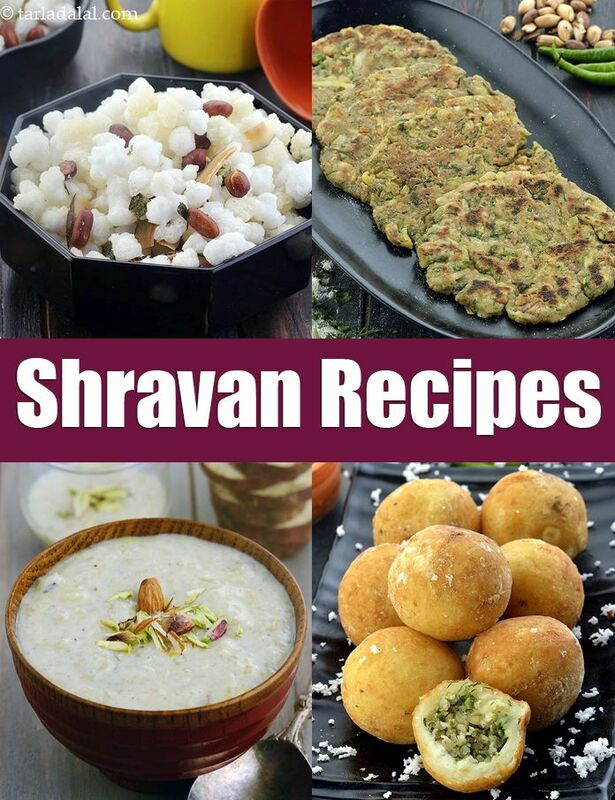 In the month of Shravan, when this incident is believed to have occurred, thousands of devotees, especially in Gujarat and Maharashtra, bathe the shivaling with raw milk and water. Bilva (or Billi) Patra and black sesame seeds are also offered to the Lord. As a sign of devotion, people exercise complete self-control during this month. They do not drink or eat non-vegetarian food. Some very religious men do not even shave throughout this month. Since this month is the beginning of the Chathurmasa period, many people also follow a practice of eating only once a day. Food with salt is consumed only once a day. Thereafter, they have fruits, nuts, milkshakes, buttermilk, tea or coffee. Devotees pray, fast and often read the Shiv Puran. Once a day, you can eat food with salt and it will be good to have wholesome but sattvic food that will keep you energized throughout the day. This article covers some of the famous recipes consumed during such fasts, including Sabudana Khichdi, Sabudana Vada Stuffed with Coconut Chutney, Potato Khichdi, Samo Khichdi, etc. Try your hand at making these, and keep yourself in perfect shape to continue your austerities with blooming health and a fresh mind. Fruit and nut milkshake, a perfect evening snack for pregnant women, who are usually advised to have small and frequent meals. With 8.1 gm of protein per glass, this energy and nutrient dense drink will surely boost the growth of the foetus. Think beyond the traditional cucumber when making raita. How about using boiled and mashed yam? you are sure to love this unconventional accompaniment. An accompaniment can make or break a meal. A well-planned accompaniment can make even a simple meal glow. Here is something to go with your meals on fasting days. The humble sabudana khichdi transforms into an interesting misal eligible for a fasting day, when topped with a peanut-potato mixture and faraali chivda.